UM-164 is a highly potent, dual c-Src/p38inhibitor of c-Src with a binding constant Kd of 2.7 nM for c-Src and inhibits both p38α and p38β. VX-745 is a potent and selective inhibitor of p38α with IC50 of 10 nM, 22-fold greater selectivity versus p38β and no inhibition to p38γ. Pamapimod (R-1503, Ro4402257) is a novel, selective inhibitor of p38 mitogen-activated protein kinase. It inhibits p38α and p38β enzymatic activity with IC50 values of 0.014±0.002 and 0.48± 0.04 microM, respectively with no activity against p38delta or p38gamma isoforms. 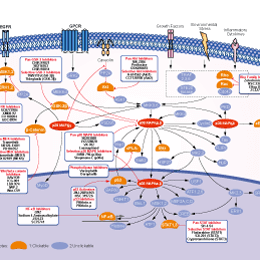 BMS-582949 is a potent and selective p38 mitogen-activated protein kinase (p38 MAPK) inhibitor with IC50 of 13nM,inhibiting both p38 kinase activity and activation of p38.